Canine Degenerative Myelopathy (DM) is an adult-onset, progressive spinal cord disease causing weakness in the hind limbs and eventually paraplegia. 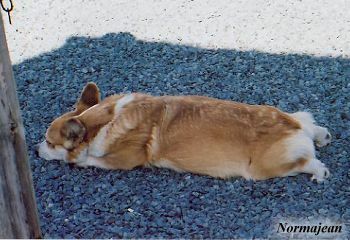 Dog owners usually elect euthanasia within a year of diagnosis; however, when euthanasia is delayed flaccid paralysis and widespread loss of muscle mass occur. Because common acquired compressive spinal cord diseases can mimic DM, a definitive diagnosis currently can only be accomplished postmortem by histopathologic observation of the spinal cord. Drs. Gary Johnson and Joan Coates at the Animal Molecular Genetics Laboratory of the University of Missouri and Drs. Claire Wade and Kerstin Lindblad-Toh at the Broad Institute of MIT/Harvard and their colleagues have identified a DNA mutation that is a major risk factor for development of degenerative myelopathy in dogs. The research project was funded by the AKC Canine Health Foundation, American Boxer Charitable Foundation, Pembroke Welsh Corgi Club of America, Rhodesian Ridgeback Club of the United States, French Bulldog Club of America, and French Bulldog Rescue League. Additional research funded by participating breed clubs and the AKC Canine Health Foundation will help answer questions that remain. Information about the benefits of this test, testing forms and instructions, and suggestions for using the test to reduce the frequency of DM will soon be available online in the DM section of www.CanineGeneticDiseases.net.